The orange extravaganza! – Nice dress! Thanks, I made it!! 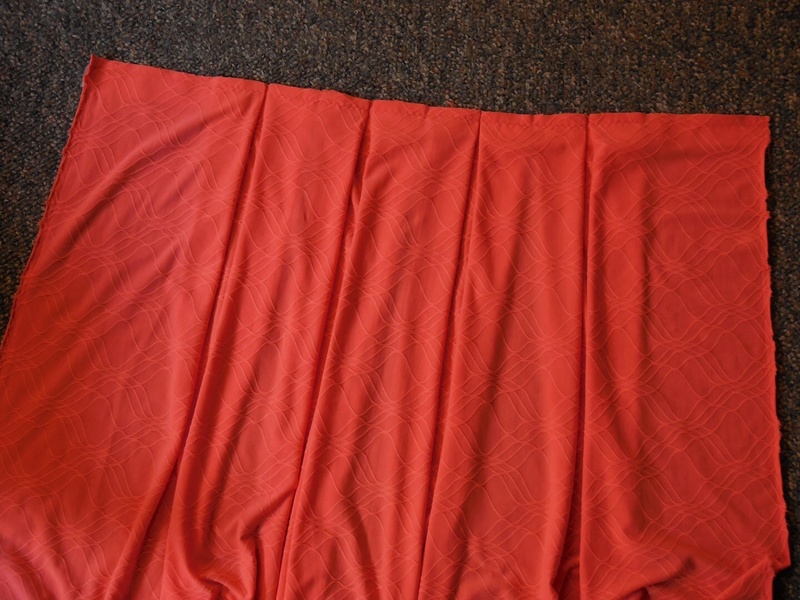 I left the remainder of the fabric almost untouched, two strips of fabric 21″ long (the length of the skirt, plus hem) and 85″ wide. Lots to work with to make my 4″ box pleats. 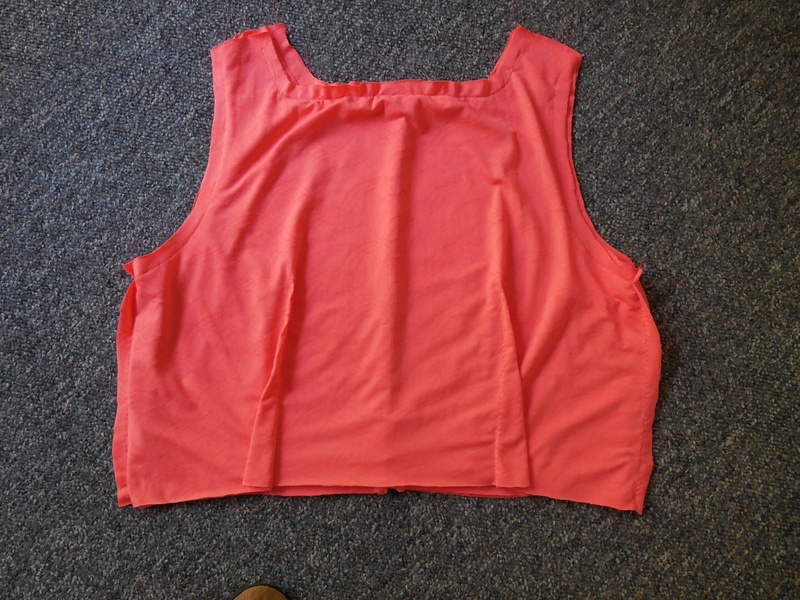 First, since this was a stretchy knit fabric, I ironed on interfacing at the waist line to ensure it wouldn’t stretch. 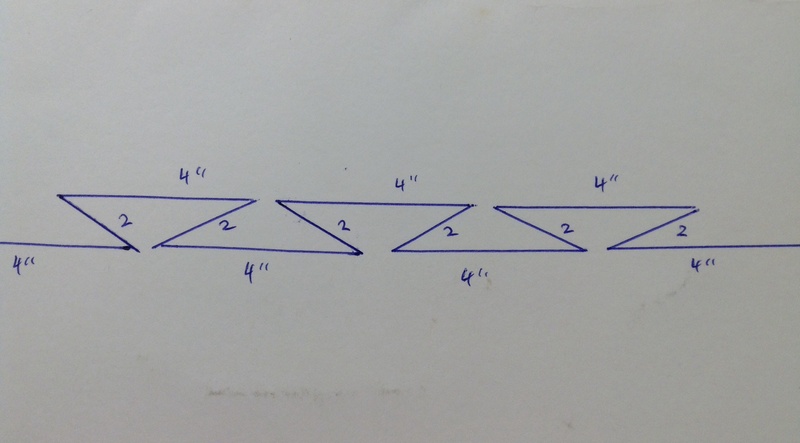 The interfacing also gave me someplace to mark my 4″, then 2″, then 4″, then 2″, and on and on. 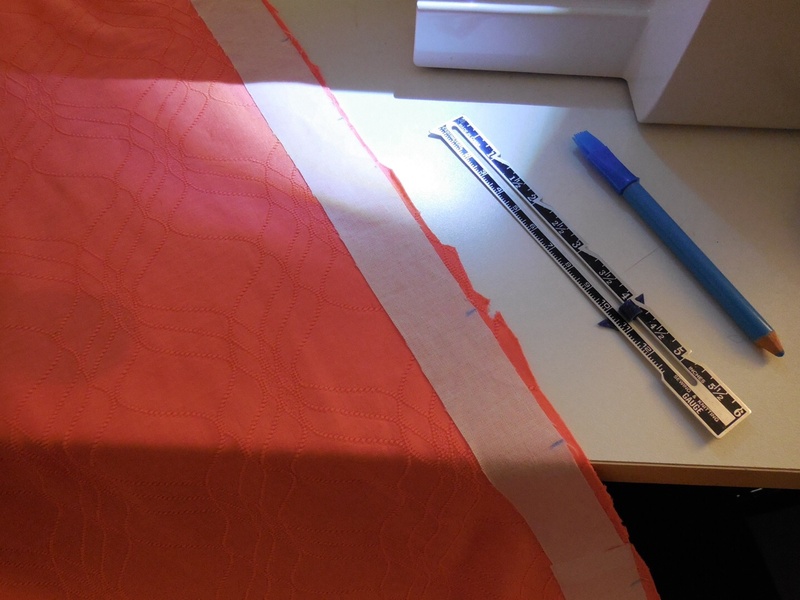 Then I folded and pinned my fabric at the marks like this…. 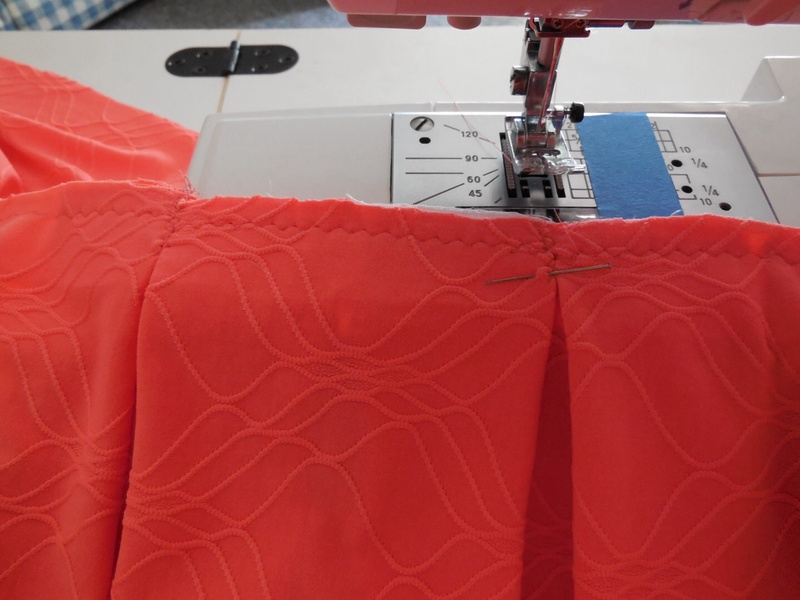 I sewed across the waist line to secure all my pleats and also, since it was a stretchy knit, zig zagged the top of each pleat together, making sure not to go past my 5/8″ seam line. Same procedure for the back panel of the skirt. Then the side seams were sewn together and the skirt of the dress was done. Now for the bodice. 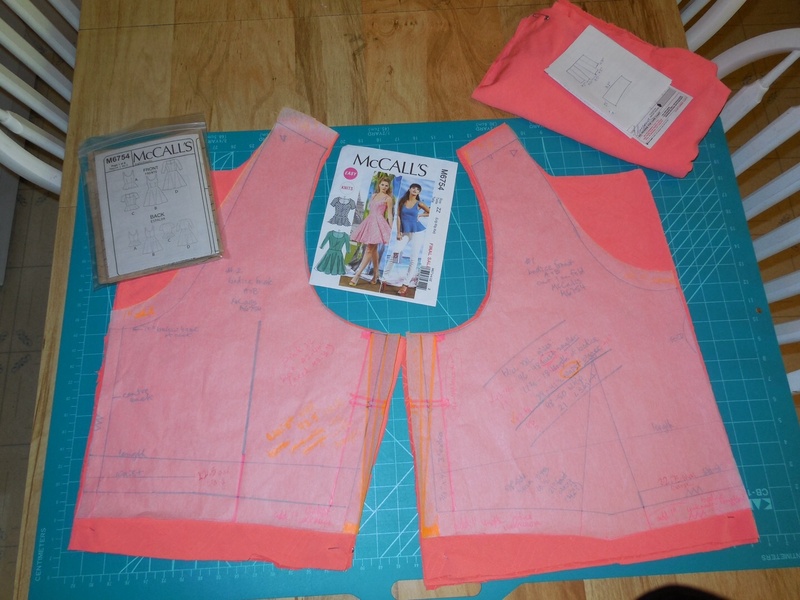 At the very start, I decided I wanted the bodice lined with the same fabric the dress was made from and I cut double pieces for the front and back. 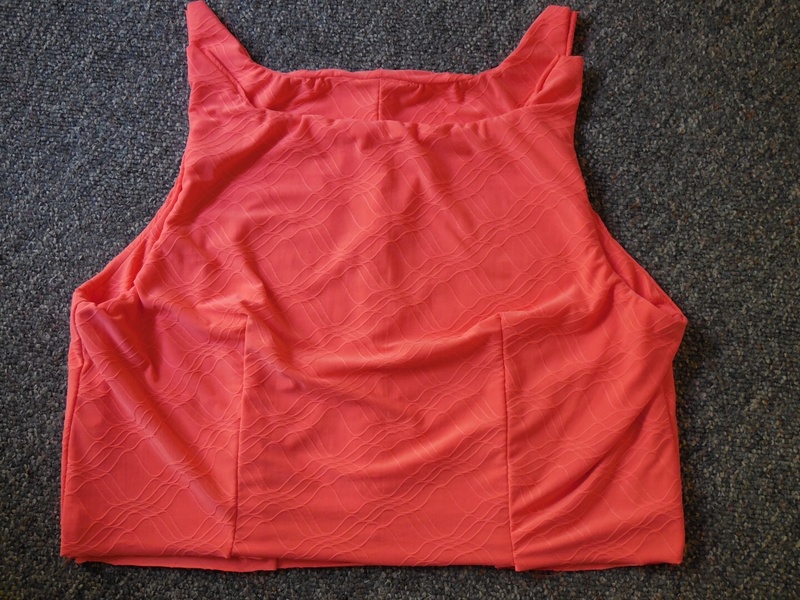 I sewed together the side seams and the back seam of the bodice and the same for the bodice lining. I stay stitched my necklines and armholes. Now the fun part. 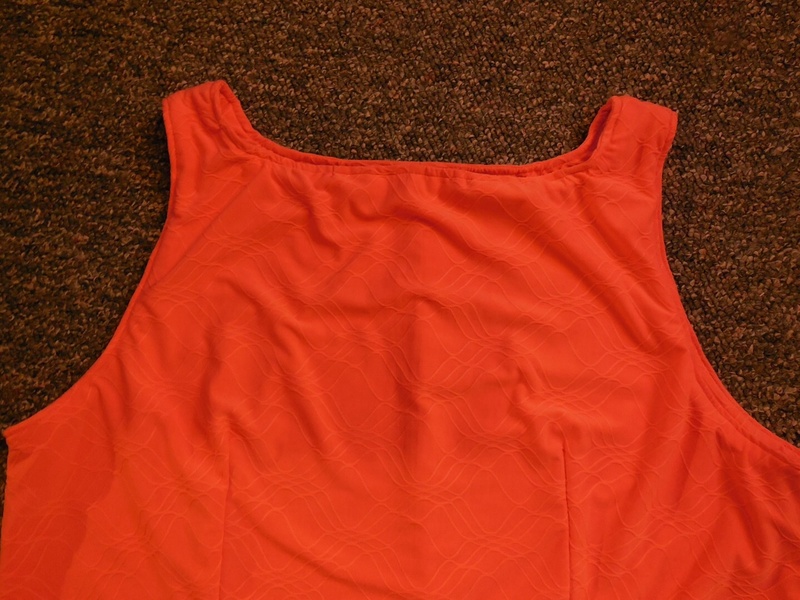 I put together my bodice and lining, right sides together, and sewed both pieces together at the armholes, the front neckline and the back neckline. Remember, I have not sewed together the shoulder seams yet. Then I turned my bodice right side out. 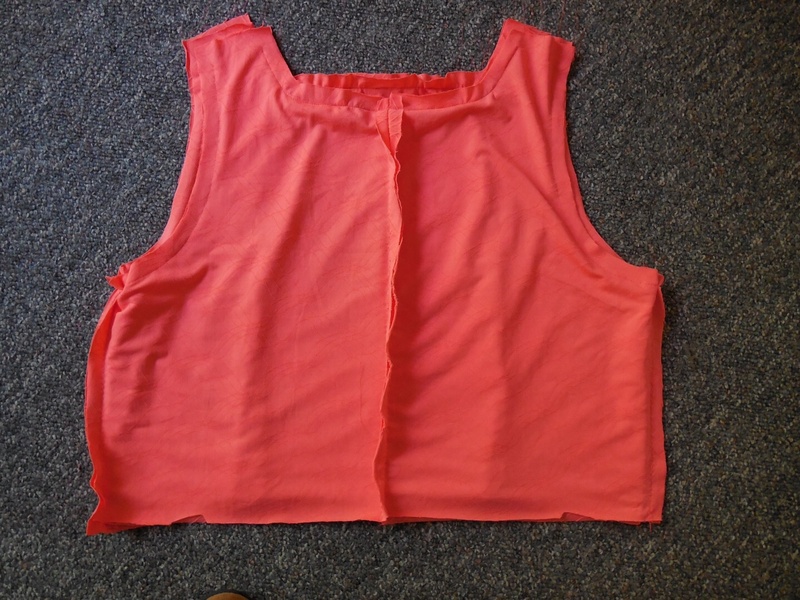 I top stitched the armholes and the neckline. Bodice done. 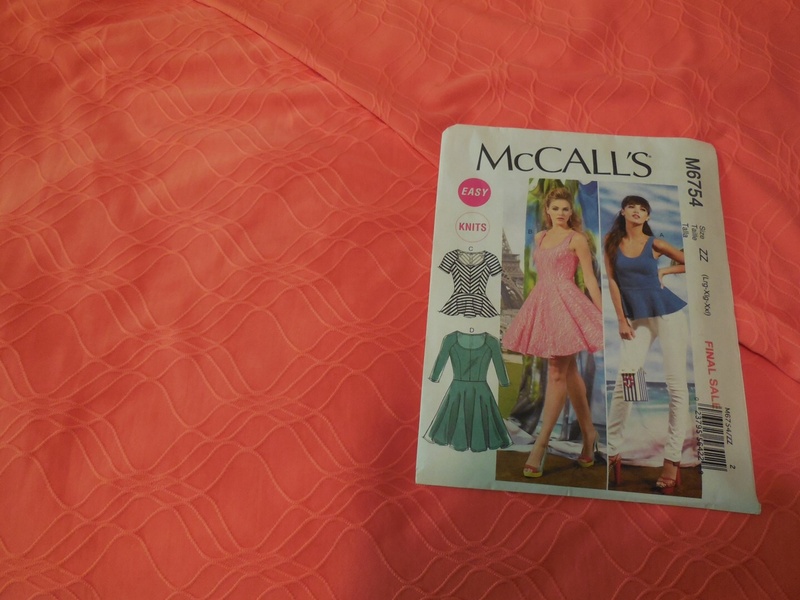 I sewed the bodice to the skirt and…. Next I meet up with my friend and her daughter to measure the hem length. 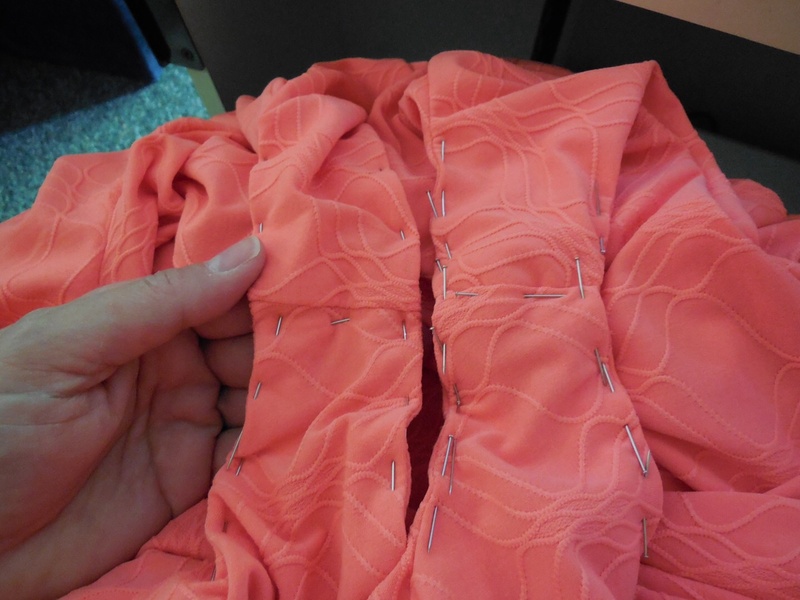 Your little pleat tut’ is very helpful- and that fabric is lovely- lucky girl! Thank you! I can’t wait to try it on her and get a final photo for my “collection”. Wow super cool. I love the box pleats! Neat trick with the lining I have never done a pattern like that before, I guess you hand stitch the straps together once you have turned it? Thank you! Yes you sew one side of the straps together on the machine and hand sew the other side after it’s turned. Hahaha, I’m jealous that you can turn nothing into something special! Hi. Can your friend’s daughter tell you where she bought the material? It is beautiful and I could see the wave. What a gorgeous dress. I want it How you did the box pleats is really cool. Yes, I really need to make this dress. Yes, where was the fabric purchased? I’m looking forward to the next installment. Cheers. She bought that material at the same place you always go to! You would be amazed what you can find if you go up and down every aisle touching everything! As soon as the hem length is checked with her, we have a fitting set up, I will put a photo on here right away, I promise! Thanks for reading/commenting! 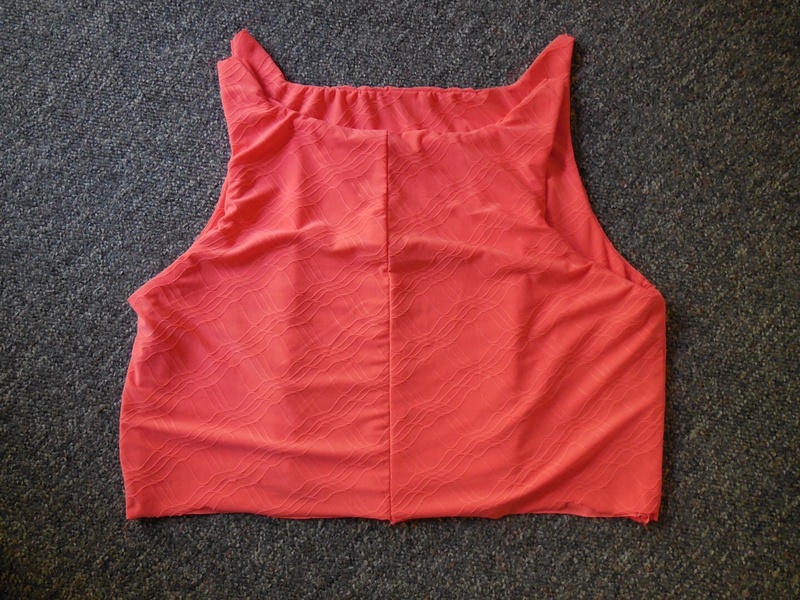 Love the way you did the bodice – looks great. Can’t wait to see how it comes out. Thank you! Almost done, then I’ll get a photo. Thank you! 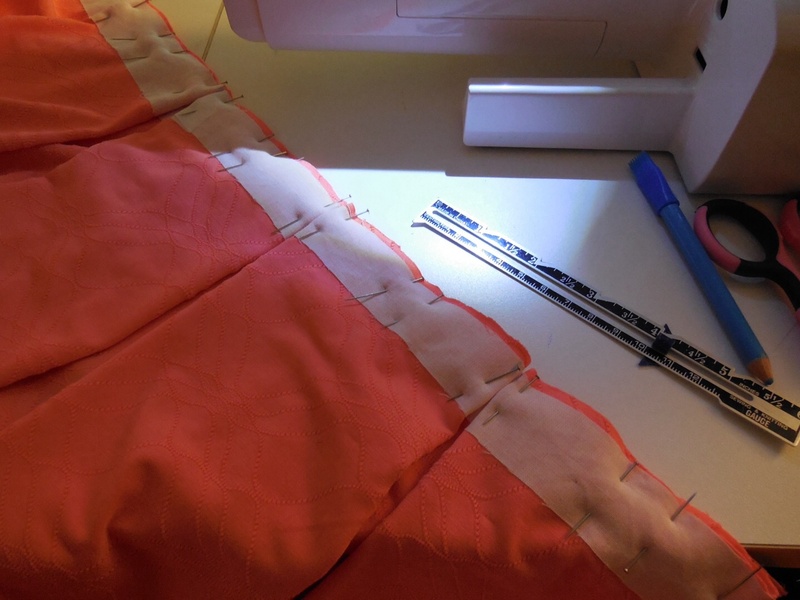 That’s why I love reading sewing blogs, someone is always doing something interesting and I have learned a lot! Be sure to post what you make so we can all see.